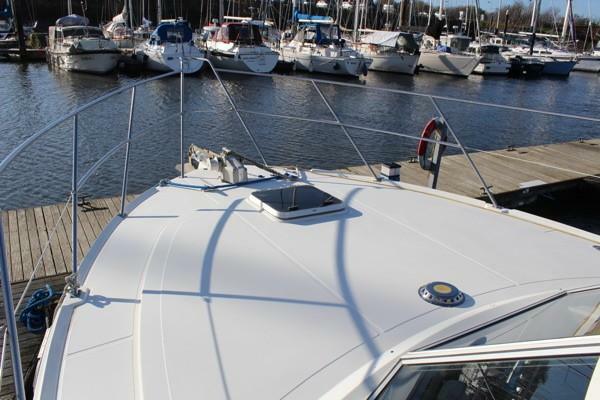 White GRP chined hull with 2/3 length centre keel. 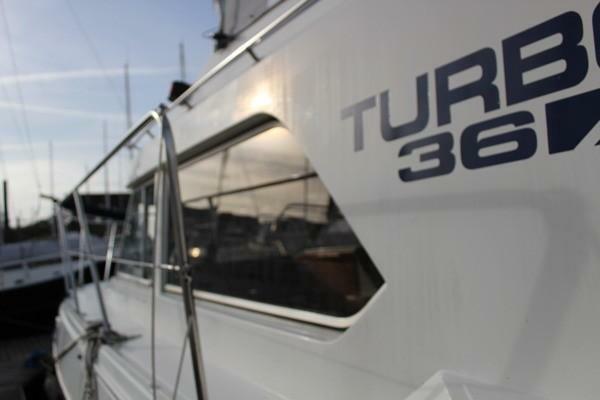 Hydraulic dual station wheel steering to twin offset rudders. 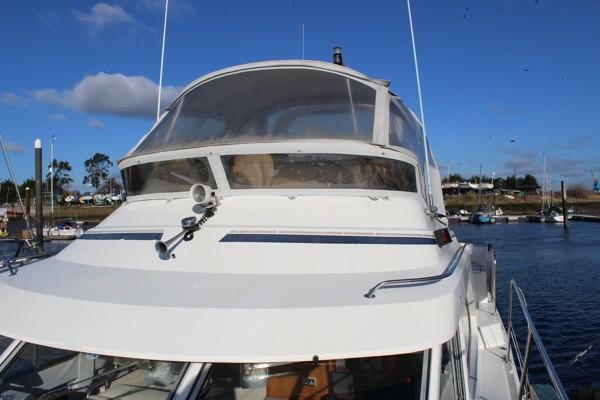 White GRP deck, superstructure and flybridge with moulded non-slip surfaces. 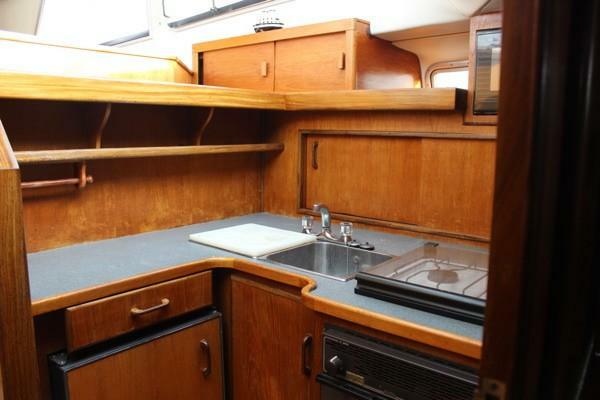 Raised aft deck and centre deck saloon. 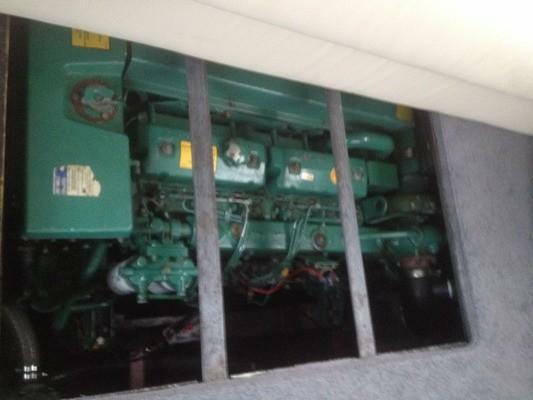 2 x Volvo TAMD61A six cylinder 306hp turbo charged, after cooled diesels. Engines fitted beneath the saloon in a sound deadened compartment. Closed circuit cooling with heat exchanger and wet exhausts. Hydraulic gearboxes with shaft driven contra-rotating four bladed propellers. Bronze P brackets. Dual station twin single lever controls. Ignition panel with rev counter, oil, temp & voltmeters at each helm. Fuel gauge. Engine hours – 1,666 & 1785 recorded. 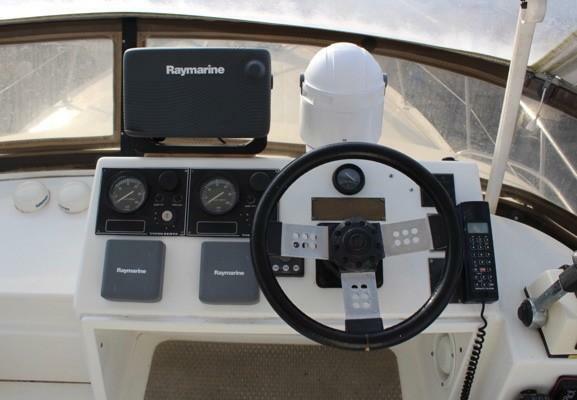 Electro hydraulic trim tabs & rudder position indicators at each helm. 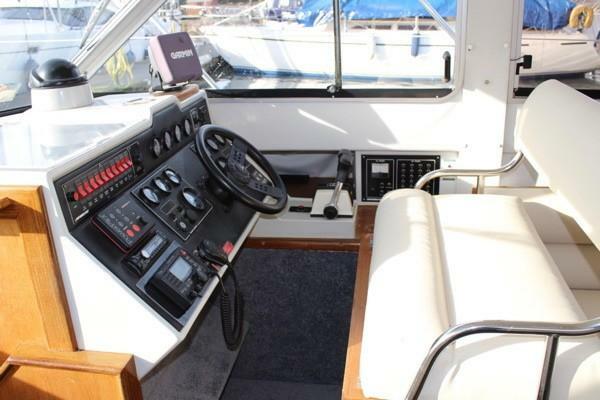 Bow thruster with dual controls. 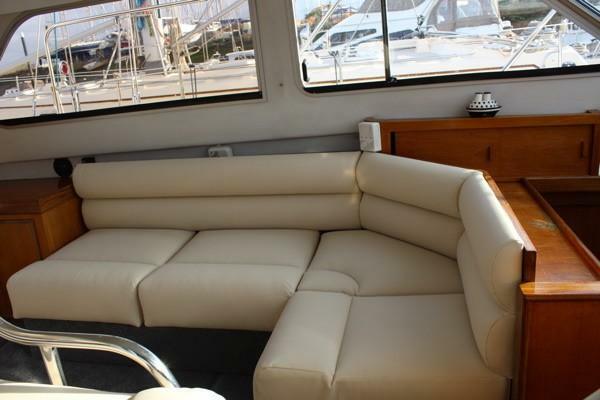 For 6 persons - Good headroom (6’3”) throughout. 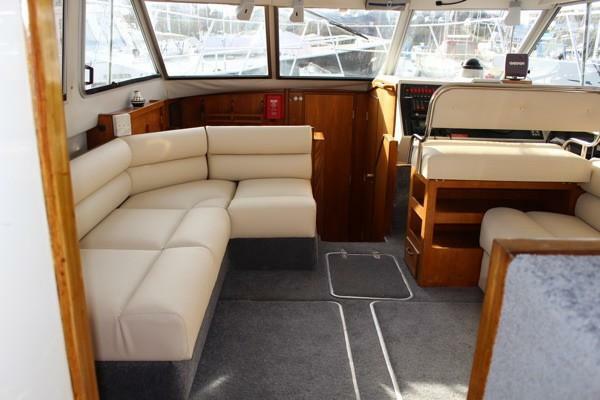 Cream leatherette upholstery to saloon & lower helm seat (new 2019). 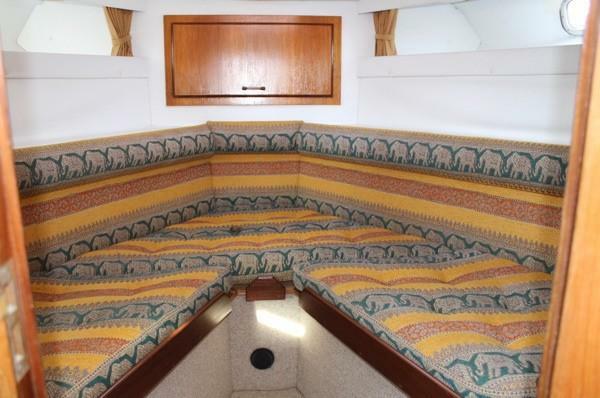 Grey/sand patterned upholstery to cabins. 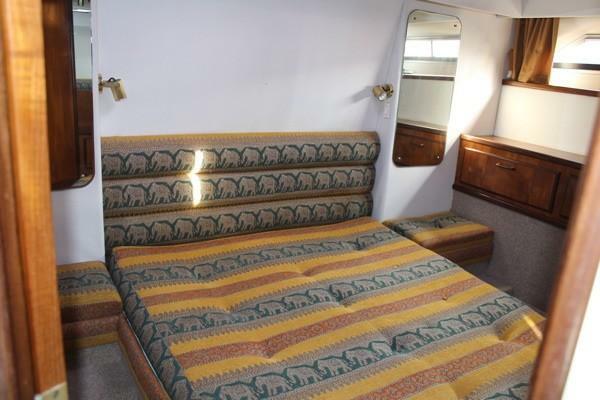 Beige curtains & carpets. Eberspacher diesel fired cabin heating. 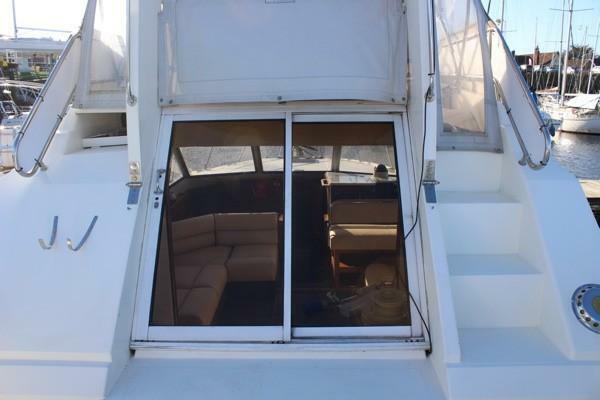 Forward cabin large double, storage below, hanging lockers, opening deck hatch. 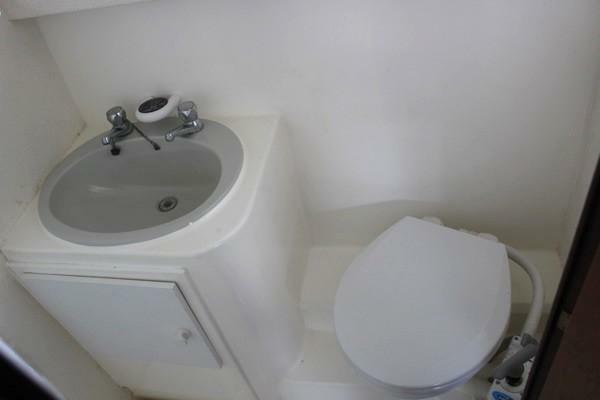 Heads to starboard with washbasin with separate shower, h&c pressure water and manually Jabsco sea toilet with holding tank. 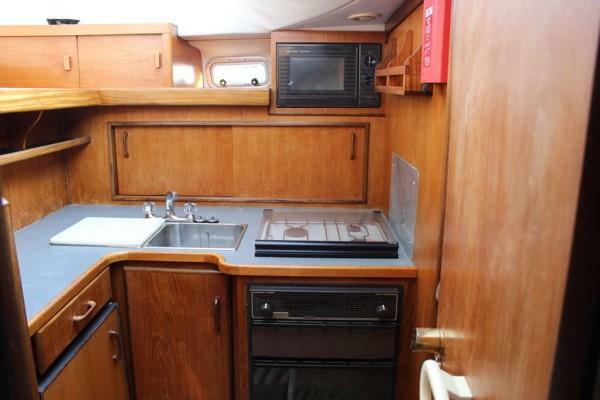 Aft cabin with large island berth, excellent stowage and en-suite heads with wash basin, h&c pressure water, shower and manual Jabsco sea toilet with holding tank. 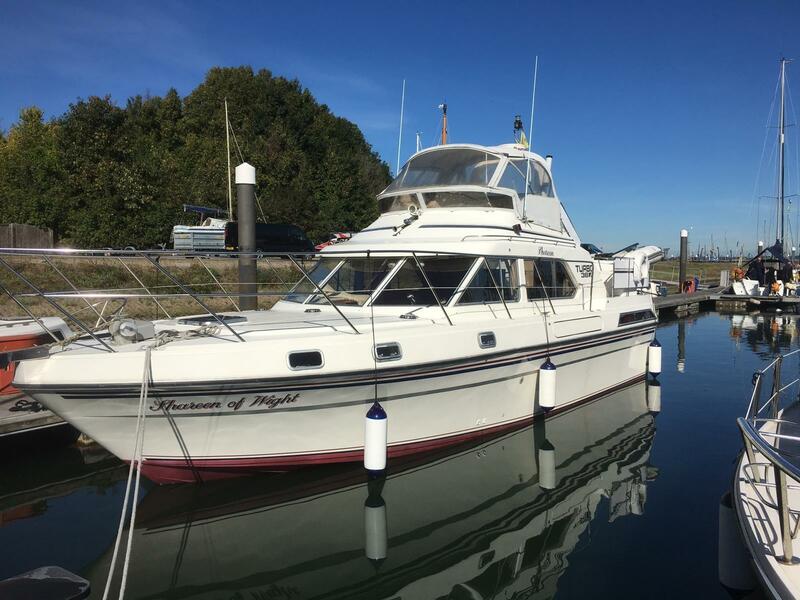 12 volt system – 4 x 12 volt batteries (2 x engine start and 2 x service)charged by engine driven alternators or battery charger via shore power. Distribution board. 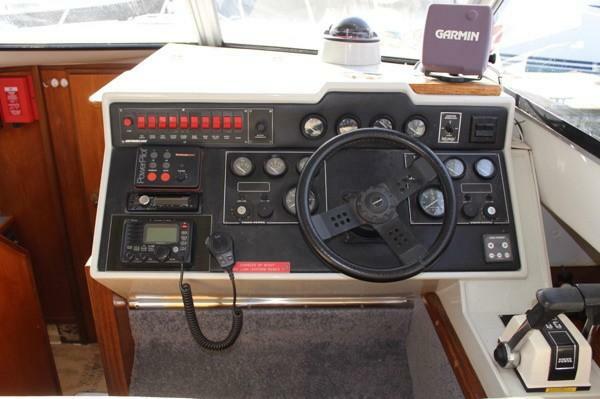 12v interior lights & navigation lights. Sony stereo radio CD player. 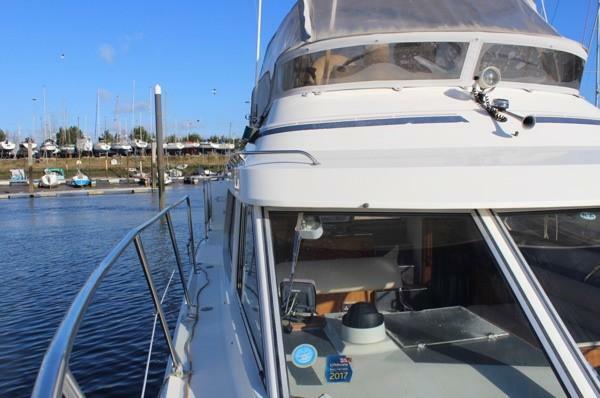 240 volt system – shorepower cable & socket, battery charger, immersion heater in calorifier tank and outlet sockets throughout. Autohelm 6000 control with built in pilot. 225 gallons fuel in two Stainless steel tanks with dual filters and crossover valve. 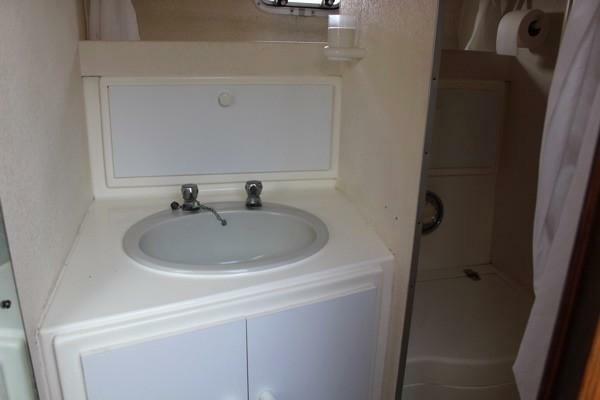 108 gallons fresh water in one GRP tank in master cabin. 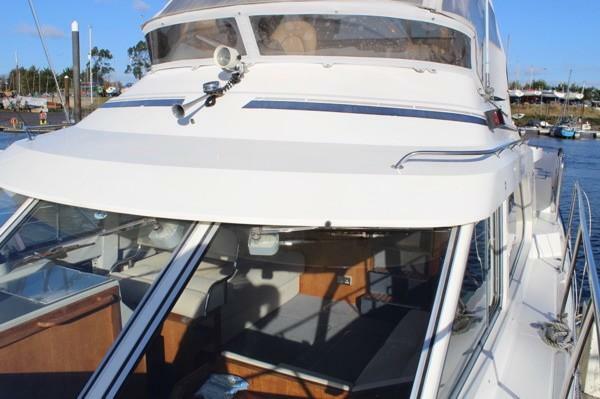 Low profile foredeck, deck saloon with flybridge over, raised aft deck. S/s bow, side and stern rails. Gates to port, starboard and aft. 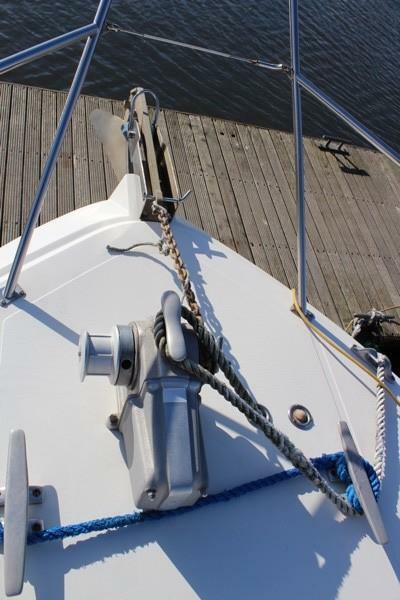 Foredeck with bow roller and self stowed anchor with chain. Electric anchor winch with controls at lower and upper helms. 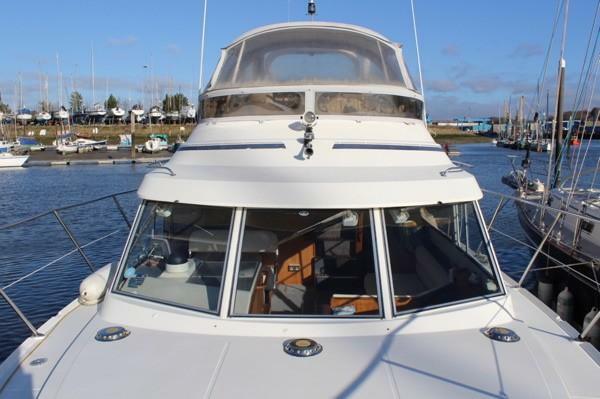 Raised aft deck with 4 x GRP deck lockers/seats & GRP dodgers. Stern mounted folding boarding ladder with teak steps. 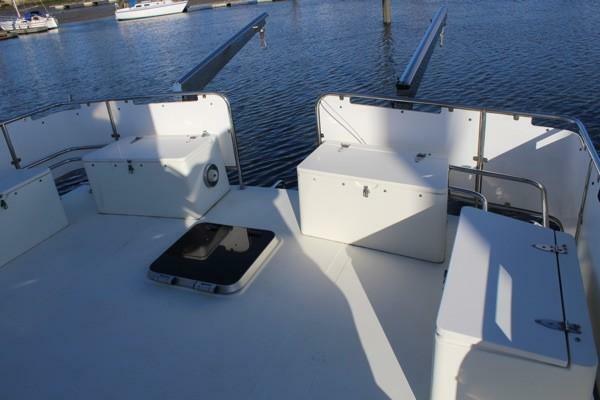 White vinyl sun pad/seat to port and seat aft. Windscreen and grey canvas enclosure canopy on S/s frame. Fire Extinguishers fitted (but not in date).